Oh. My. Goodness. The only way my trip home from Scotland could have been any worse would be if it had been on the Titanic. What started out as a simple, albeit long, series of flights home turned into the odyssey of a lifetime. I'll just put it out there- the United Kingdom needs to get its act together. Beau and I left St Andrews at 5 in the morning last on Saturday December 18. We took a shuttle to the Edinburgh airport, whizzed through security, and hopped on our plane. We arrived to Heathrow with no issue; things were looking good. At about 11:55, with only five minutes until our plane was supposed to board, a voice came over the loud speaker. "Heathrow airport is temporarily closed," it declared. Oh no. We waited and waited. And waited some more. Finally, 8 hours later, they announced that Continental flight 111 to Newark would, in fact, be taking off. It was a miracle! Beau and I, along with all of our new airport friends, cheered and started gathering things together. Passport? Check. Boarding pass? Check. Carry-on luggage? Check. We were ready to go. Suddenly we noticed a large group of neon-vested people milling around the gate. This was either really good or really, really bad. The loud speaker came on again, "Flight 111 to Newark has now been canceled." An audible wave of groans spread across the terminal. Everyone was furious. Beau and I frantically started calling the airline trying to get re-booked. We finally landed ourselves on a flight home on the 21st. It was later than we had intended but still early enough to get some shopping done on King Street. We took a train into central London to my friend Polly's house, where we were going to crash for a few days until Tuesday. Sunday and Monday came and went. At midnight on Monday, Beau decided to check on our flight, as Heathrow's twitter was directing people to double check their flights. Sure enough, our flight had been canceled again. I wanted to scream. Instead, I just punched a pillow or two. Beau immediately got on the phone to Continental. Could they really only get us out on the 27th? My mom was proactive and booked another flight on U.S. Airways out of Manchester on Christmas Eve, so that was that. We took over the Mitchell's house for a few more days until we were off to Manchester. Beau and I arrived to Euston station early, just to ensure things went our way. As we stepped inside, the signboards announcing the platforms were flashing. 'Manchester, 12:40, Canceled' We couldn't believe our luck. Rather than wait around, we hopped onto an earlier train that had been delayed and stood the whole 3 hours to Manchester. Two days in an 'oriental-themed' room of the airport Radisson, eating terrible room service, and cleaning out the mini fridge was almost enough to push me over the edge. But there was that beacon of hope. We were going to be home on Christmas Eve! In time to go to dinner with our family! Waking up on Christmas morning in my own bed! But of course that's not what happened. Beau and I awoke to a not-so-glorious email from our mom saying that our flight was delayed, meaning we would miss our connection and spend the night in Philadelphia. Luckily, we did get home in time for Christmas, and it was lovely. 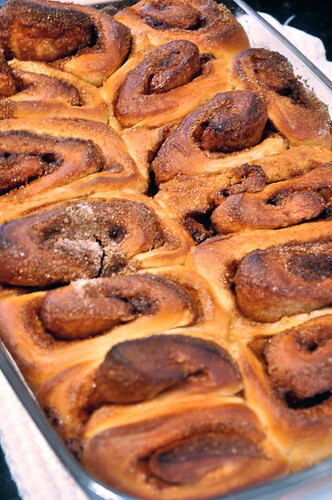 Our traditional Christmas breakfast was postponed, but we still got to enjoy annual treat of cinnamon buns. Warm, spicy, and delicious. Right from the oven. Now, I didn't make these this year, but I've helped my mom in years past. The filling is gooey and sweet, but it doesn't overwhelm the dough. The icing is just what you need. 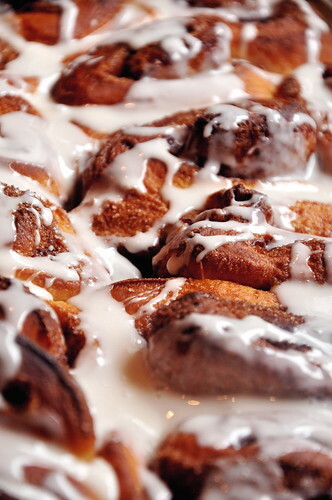 It isn't too rich like many cream cheese icings that usually accompany cinnamon buns. They are so perfect that I might just make a batch for myself. I'm sure no one in the house would complain. I am so glad to be back here with you, and I hope your holidays were wonderful and much less stressful than mine! Butter a 10 x 14-inch baking pan. Preheat the oven to 375 degrees. Whisk together 2 1/4 cup of the flour, yeast, sugar, and salt and set aside. Heat the milk in a small saucepan with the water and butter until warm to the touch (butter does not have to melt). Stir into the dry ingredients. Add the eggs and stir until moistened. Beat with an electric mixer on medium speed for 3 minutes. Carefully stir in enough of the remaining flour to make a soft dough. Knead for 5-8 minutes until the dough is smooth. Turn into a greased bowl, cover, and leave for about an hour, or until the dough has risen. Combine the brown sugar, sugar, and cinnamon in a small bowl and set aside. Punch the dough down and roll out into a 10 x 12-inch rectangle on a floured surface. 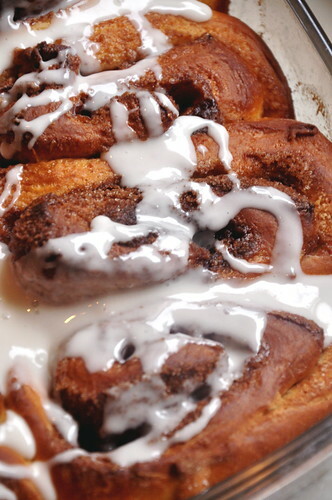 Spread the softened butter across the rectangle of dough and sprinkle with the cinnamon sugar mixture. Roll up, as if making a jellyroll, beginning with a long side, and pinch the seam to seal. Cut into 16 slices and arrange in the buttered pan. Cover and let rise for 30 minutes more. Bake for 20-25 minutes. Meanwhile, whisk the powdered sugar, vanilla, and milk together in a small bowl. Remove from the pan. 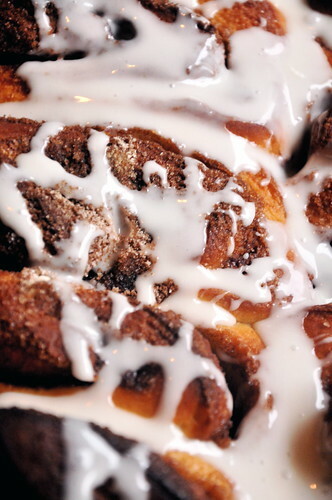 Drizzle with icing and serve warm.